What It’s About: The second Mrs. de Winter (Joan Fontaine) meets her wealthy husband, Maxim de Winter (Laurence Olivier) in Monte Carlo and the pairs whirlwind romance ends in a quick marriage. 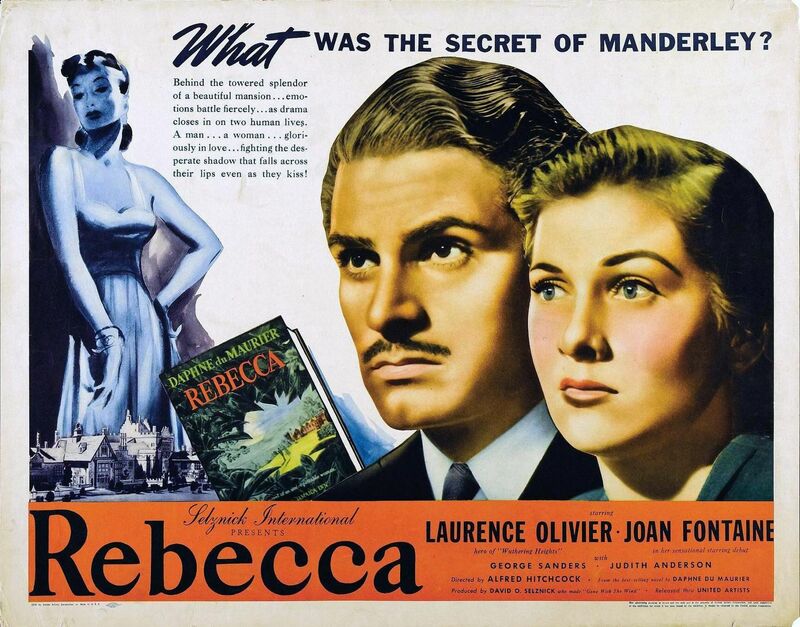 When she returns to Manderlay, his sprawling estate in Cornwall, however, she finds Maxim changed, the servants unfriendly, and herself living in the shadow of Rebecca, the first Mrs. de Winter. Why Watch it Today? : Lead actress Joan Fontaine, sister of Olivia De Havilland, was born today in 1917. Since her birthday falls in October, celebrate with this atmospheric romantic thriller from director Alfred Hitchcock and writer Daphne Du Maruier, who also brought us The Birds and Don’t Look Now. Other Choices: Fontaine also appeared in former Movie of the Day Gunga Din. This entry was posted in Adaptation, Based on a Book, Black and White, Drama, Independent, Movie of the Day, Mystery, Romance, The Original, Thriller and tagged Alfred Hitchcock, Best Actor Nominee, Best Actress Nominee, Best Adapted Screenplay Nominee, Best Art Direction Nominee, Best Cinematography, Best Director Nominee, Best Effects-Best Special Effects Nominee, Best Film Editing Nominee, Best Original Score Nominee, Best Picture, Best Supporting Actress Nominee, C. Aubrey Smith, Daphne du Maurier, David O. Selznick, George Sanders, Gothic, Joan Fontaine, Judith Anderson, Laurence Olivier, Leo G. Carroll, Nigel Bruce, Reginald Denny, Selznick International Pictures, United Artists.